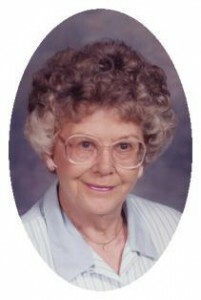 Ruth E. Miller (nee Roets),87, of S. Moorland Road in New Berlin, Wisconsin died Monday, August 3, 2009 at Lindengrove of New Berlin. She was born July 19, 1922 in Milwaukee, Wisconsin to frederick and Ella Koplin Roets. On October 4, 1941 she married Gilbert L. Miller of Split Rock, Wisconsin in St. Charles, Missouri. She worked at the former Hanson Glove Company in Milwaukee. The couple moved to Port Washington from Milwaukee in 1951 and resided on Roger Street and she began working for the former Badger Outerwear until it closed. She was a member of First Congregational Church and was active in various aspects with the Church Ladies and luncheons. She enjoyed gardening and sewing and was also active with Meals on Wheels and the Port Washington Food Pantry. Her husband Gilbert preceded her in death January 9, 1991 and she moved to New Berlin to be closer to her daughter in September 2008. Ruth is survived by her daughter Jackie (Nick Philippi) Evenson of New Berlin, Wisconsin and grandson Brian (Candie) Cheselski of Stephenville, Texas. Further survived by a brother Edward (Carol) Roets of New Berlin, Wisconsin, other relative and friends. Preceded by her husband and numerous brothers and sisters. The Reverend Jeff Suddendorf will officiate funeral services 11 am Wednesday, August 5, 2009 at the funeral home. Interment Union Cemetery, Port Washington. Visitation 10 – 11 am Wednesday at the funeral home. Memorials appreciated.